*Participants are limited to the students from Kuala Lumpur and Selangor (Malaysia). No. 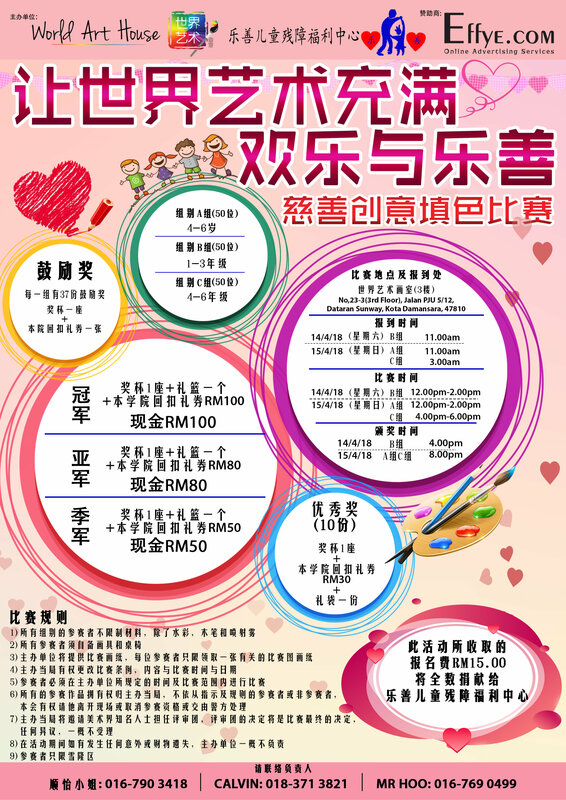 23-3 (3rd Floor), Jalan PJU 5/12, Dataran Sunway, Kota Damansara, 47810 Petaling Jaya, Selangor, Malaysia. The registration fee RM15 collected from this activity will be donated to the Persatuan Insan Istimewa Cheras Selangor (PIICS). 🏆 Please contact one of our person in charge to verify your registration! Thank you! 1) All participants do not limit their materials except watercolour, wood pens and spray fog. 2) All participants must bring their own drawing materials, chairs and tables. 3) The organizer will provide drawing paper. Each contestant will only receive one related drawing paper. 4) The organizer reserves the right to change the rules, content, competition time or dates. 5) Participants must compete within the time and within the competition specified by the organizer. 6) All entries are owned by the organizer. Participants who are not in accordance with the instructions and rules, or who are not contestants, the organizer have the right to request him/her to leave the site, disqualify or submit them to the police. 7) The organizer will invite well-known people in the art community as the jury. The jury’s decision will be the final decision of the competition. Any objections will not be accepted. 8) The organizer is not responsible for any accident or financial loss during the event. 9) Participants are limited to the students from Kuala Lumpur and Selangor (Malaysia).